So I want to relieve you of the suspense I left you in as of my last post and show you the current chapter in the story of my striped curtains. 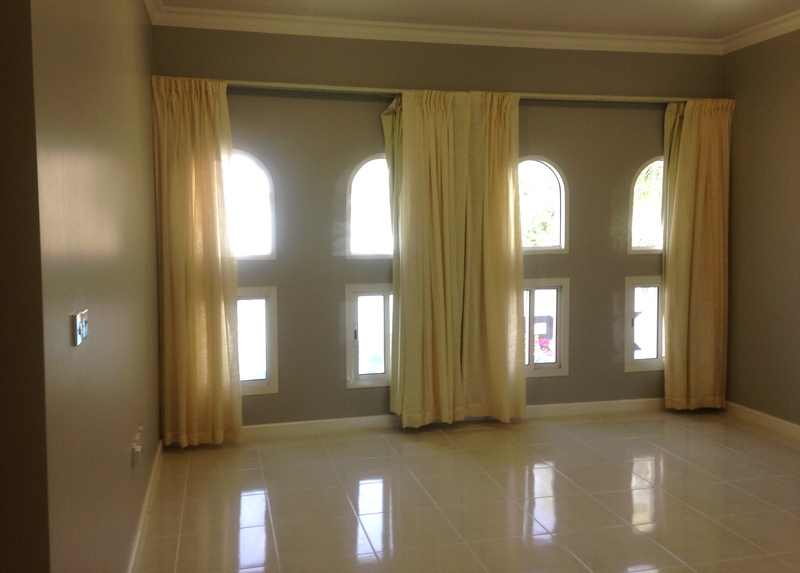 They have never looked better and ironically seem to have been custom designed for their new home framing the little charming arched windows that made me want this house in the first place. The rest of the bedroom has been updated too and I want to talk a little bit about that process, especially in response to all the inquiries I have been having lately about how to think about changing or modernizing a space when you have limited resources and no ideas on how to start. Now don’t get me wrong, I love the items in our bedroom, but here in Doha (and to a certain extent in Tokyo) they had started to feel too ‘Paris flea market’ if such a thing is possible. Almost all the furniture is 19th century antique French – even my winter duvet is made from antique document print curtain panels sourced at les puces. 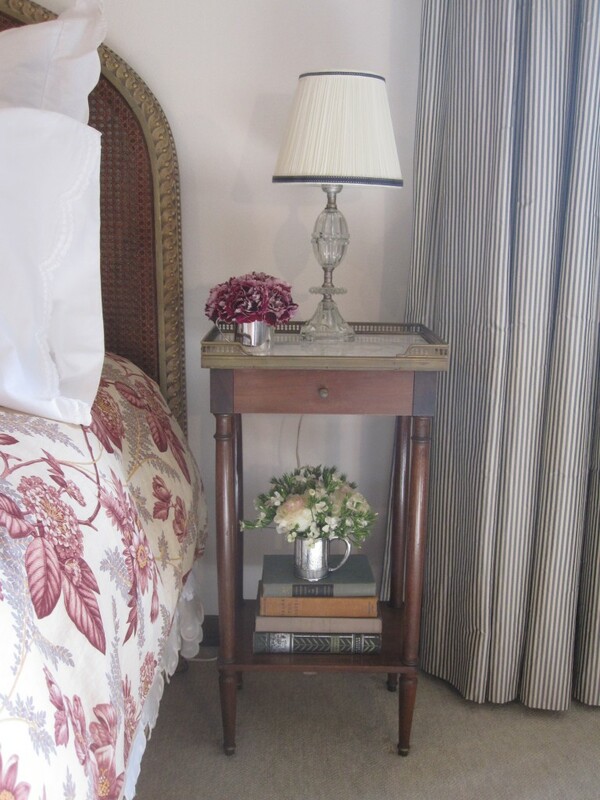 The tiny French night stands shown below in our Tokyo bedroom were purchased originally for a New York bedroom so small that there was barely 18 inches on the side of the bed and both they and the sweet lamps were completely insubstantial in our new cavernous Doha bedroom. By choice and by the default based on availability I talked about last time, the rest of the house had brightened with a more modern eclectic mix and the bedroom needed to join in that party. For years in Tokyo I had been dreaming of getting my gray painted walls again but now, with the gray tiled floor, everything felt too gray and too subtle. The room was screaming for some color punctuation, although I did not want to lose its overall soothing vibe. So the starting point was to think about what might be easy to change like textiles, bedding and accessories, using a Pinterest board and inspiration photos as a way to narrow down choices and test combinations. 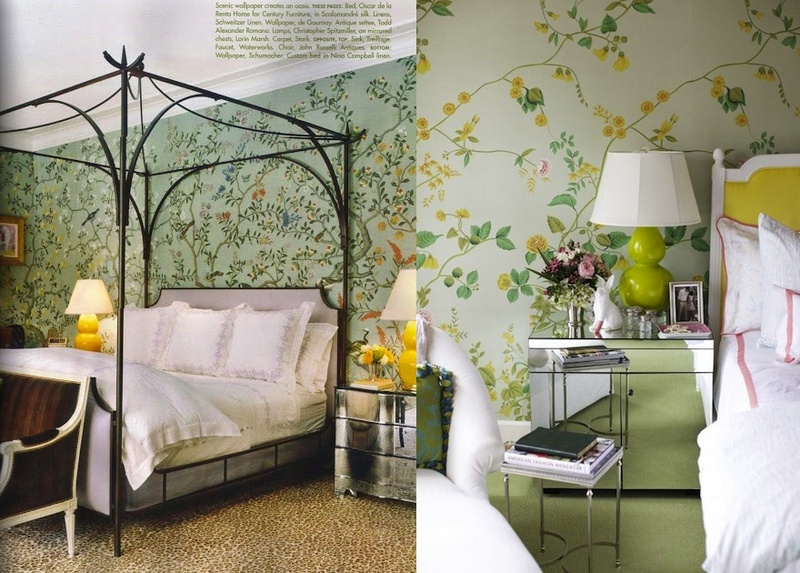 My main inspiration came from two very different bedrooms, by two very different style designers. The first one, by Bunny Williams is in a formal Park Avenue apartment, full of gorgeous storied antiques. The mirrored bed is a 1930s piece by French designer/artist Serge Roche. 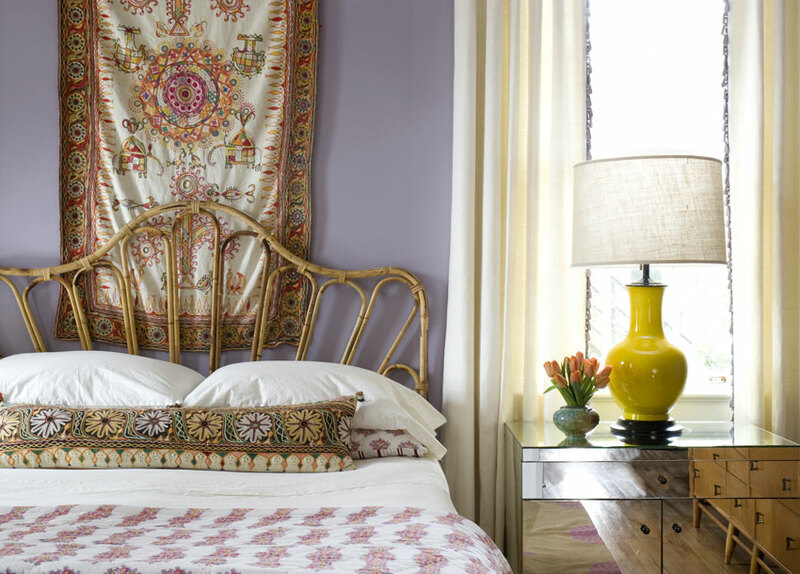 The headboard is upholstered in a spectacular Indian-inspired silk embroidery by Naeem Khan. You can see more of this space in The Wall Street Journal and the New York Social Diary. Vignettes of collected objects and art, as well as simple white ruffled linens against a soft color palette speak to the antiquarian in me. Much of the furniture is from a similar place and time as mine. The other bedroom is in a 1940s home in Charleston, designed by Angie Hranowsky and featured in Lonny Magazine. It is often referred to in blog posts on ‘boho glam’ or some other silly name as it unexpectedly combines casual elements such as a rattan headboard with a more glamorous material like the mirrored nightstands. The lavender is of course my long standing favorite, but the unexpected surprise of the yellow is what really captured my attention, along with the incredible textile mix against simple white sheets. So what binds these two very different spaces together? You might say nothing, but for me, they are filtered through the lens of what I have to work with plus the feeling I want to create. The Bunny Williams bedroom has a softened pretty formality that I can’t escape with the majority of the furniture I already own. 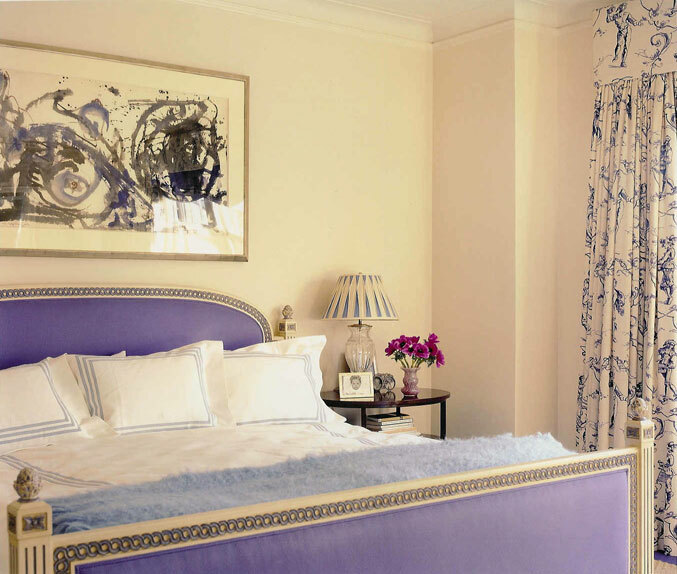 The Angie Hranowsky bedroom has relaxed vibe I’d like to add, along with a color palette I adore. The actual binding between them is in the mirrored pieces (bed and night stands) and the handmade textiles – the Indian embroidery above Williams’ bed and the tapestry, bolster pillow and block printed John Robshaw quilt in the Hranowsky bedroom. I knew an embroidered ethnic textile – I was thinking suzani or something similar originally – would soften the formality of the furniture and bring in the color and visual interest I was looking for. But from a practical point of view, my husband and I are duvet sleepers and nothing will change that. I didn’t want a fussy extra coverlet that served no purpose other than display. 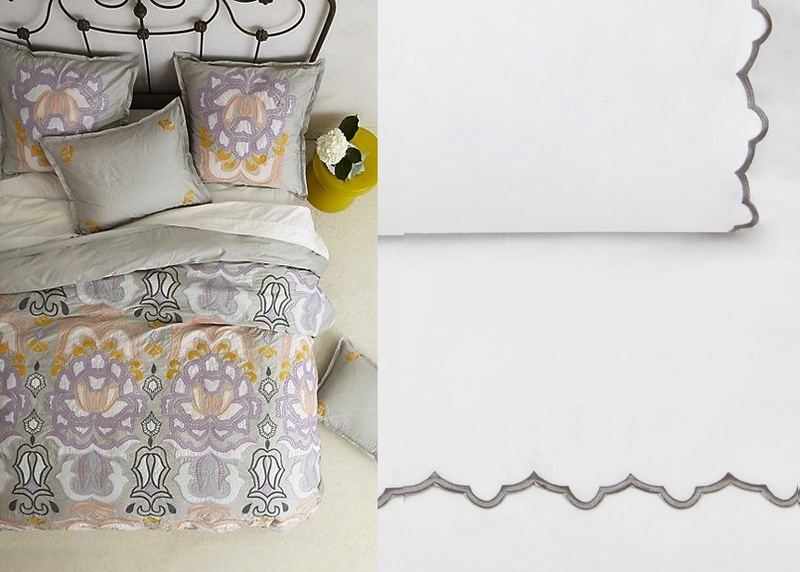 As luck would have it, a ready-made savior came in the form of the Safia Embroidered Duvet Cover from Anthropologie. It is so perfect, it’s as if I conjured it, with its Indian applique and embroidery and exact color palette. 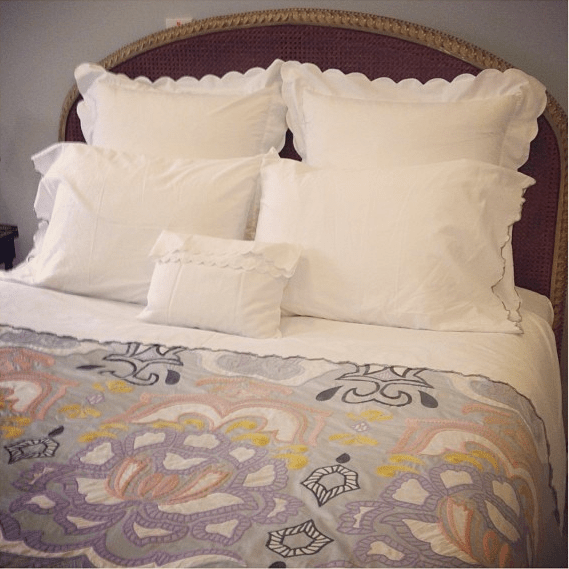 It didn’t hurt either that it coupled perfectly with the new Gray Scalloped Embroidered Sheets Set from Crane & Canopy and my other vintage white bed linens. Another key component of all the inspiration spaces I was using was mirror – for two main reasons. 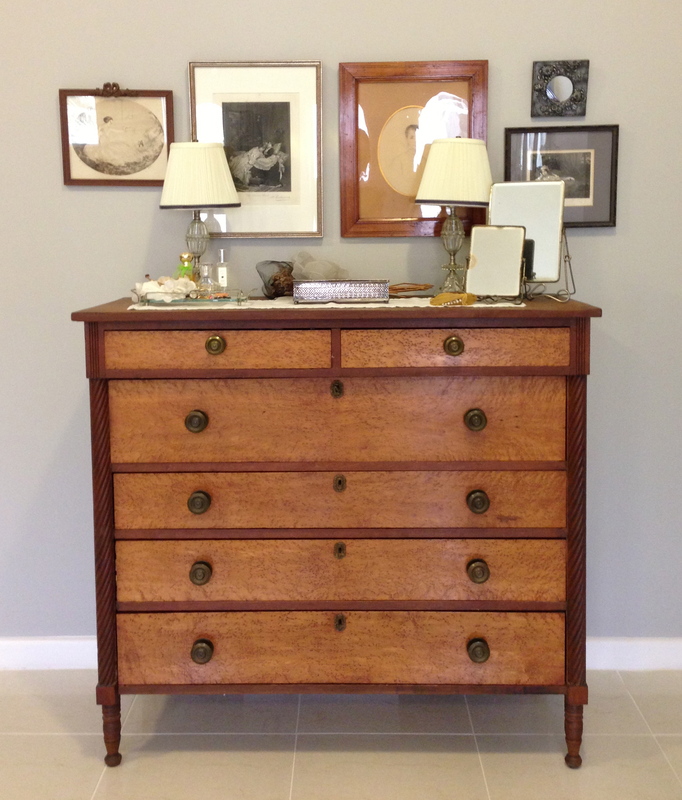 The original impetus was to add another material, another finish, to all the wood furniture. Part of what kept the room trapped in the past was that lack of variety, and even though the bed frame is painted, everything else is medium to dark wood tone. A mirrored surface provides much needed contrast while also being dressy enough to hold its own with the French antiques. But the second reason – the expat reason of its possible availability – is what truly made it compelling. As I’ve mentioned before, the local population here likes very glitzy interiors so I knew that somewhere out there something along the lines of what I was looking for existed. While my fantasy tables were of the vintage 1940s variety like these on the left from 1stdibs, settling for these brand new ones from the main mass market furniture store here in Doha didn’t feel like such a terrible compromise. The fact that they were also a fraction of the price didn’t hurt and honestly, their modernity, their newness, provides even more needed contrast with the rest of the room. 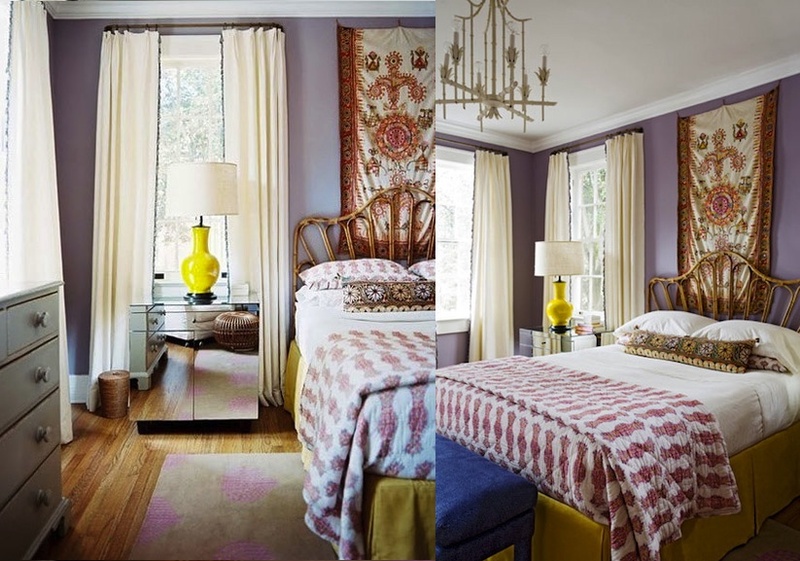 Other inspiration photos included one detail again and again – simple yellow ceramic gourd or vase-shaped lamps like the ones in the Angie Hranowsky bedroom, here in two stand-out rooms by Miles Redd and Bailey McCarthy. Most are Christopher Spitzmiller, which once again is not available here (although those of you in New York right now can go to the last day of his Summer Seconds Sale today!!!!) nor are there many similar options. This was a situation in which local sourcing just wasn’t going to happen. On a trip to Hong Kong last November I hunted for a pair of Imperial yellow porcelain vases to convert to lamps, but had no luck either. That left the internet, which is sometimes the only option when you know you want something very specific. 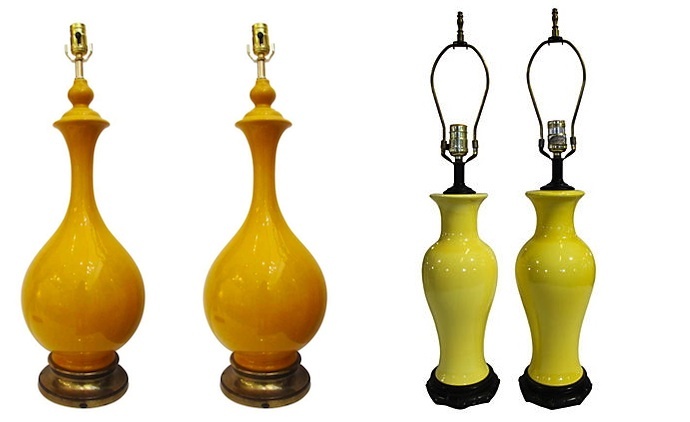 I was obsessed with the gorgeous pair of yellow lamps on the left from Palm Beach Antiques Center, but no matter how I tried to spin it, they were way too large and a bit too orange. I’m still in love with their shape and luster and they are still available along with numerous other beauties. In the end, One Kings Lane delivered with this pair of more vase-shaped lamps with a Chinese mount. They were a bargain – especially if you compare similar pieces on 1st dibs (subtract an entire digit from those prices). And for another expat homily, sometimes the price of doing business and living your life is costly shipping. Luckily, I had finally joined Aramax, an international shipping service that delivers here pretty reliably and at fairly reasonable cost. Since the lamps were a bargain, paying their price over again in shipping was worth it. All in, they still cost less than many other choices. The combination is bringing me great visual pleasure and the functionality of the taller, more substantial lamps and the extra drawer space the night stands provide can’t be beat. The room is not finished, but has certainly made strides in the right direction. Finding a floor covering is high on my list as getting out of bed to those acres of cold tiles isn’t very nice. In typical expat style I brought a giant empty suitcase with me on a quick trip back to the US a few weeks ago and stuffed it with a giant wool flokati rug. It never made it up to the bedroom, getting hijacked by the living room along the way, where there were also acres of cold tiles. I’d love to add a chaise or other comfy chair to the corner next to the settee, where some old world crystal sconces have been hung on either side of a trio of painterly lithographs by Japanese printmaker Keisuke Yamamoto. What an interesting coincidence that these prints are all about the arches and now they are hanging in a bedroom that is kinda all about the arches too. I happened to stumble across these yellow pillows in the housewares isle of our local supermarket (!) so I grabbed them, knowing they wouldn’t be there if I hesitated. Playing around with other pillow choices on the Pinterest board. Along those lines of mixing old and new, I’d like to find a great piece of abstract art to hang over the bed, a little like this combo in a room designed by Amanda Nisbet. Although I’m laughing a bit, as the night table lamps remind me so much of my old ones – they could use a little beefing up I think. 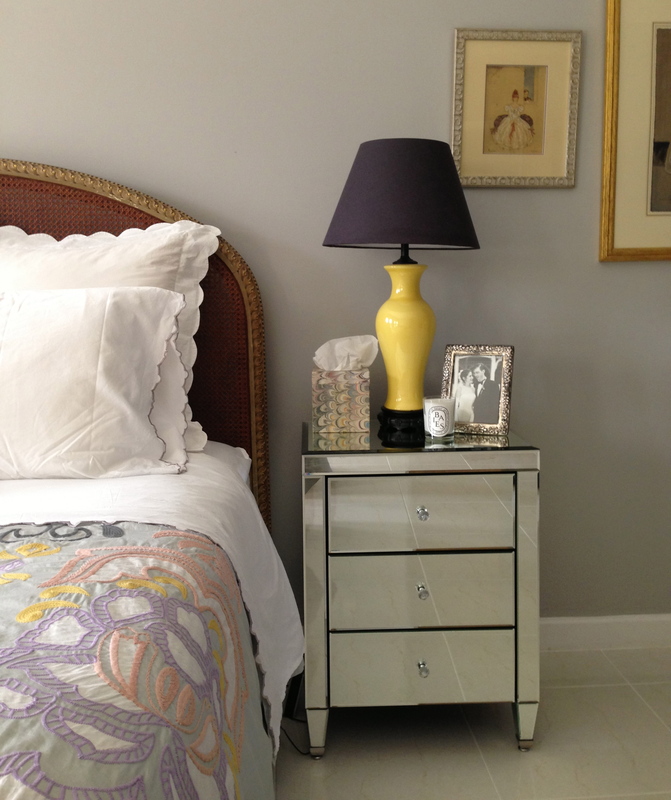 Those little lamps have been relocated to atop the dresser, in similar style to the Bunny Williams bedroom. 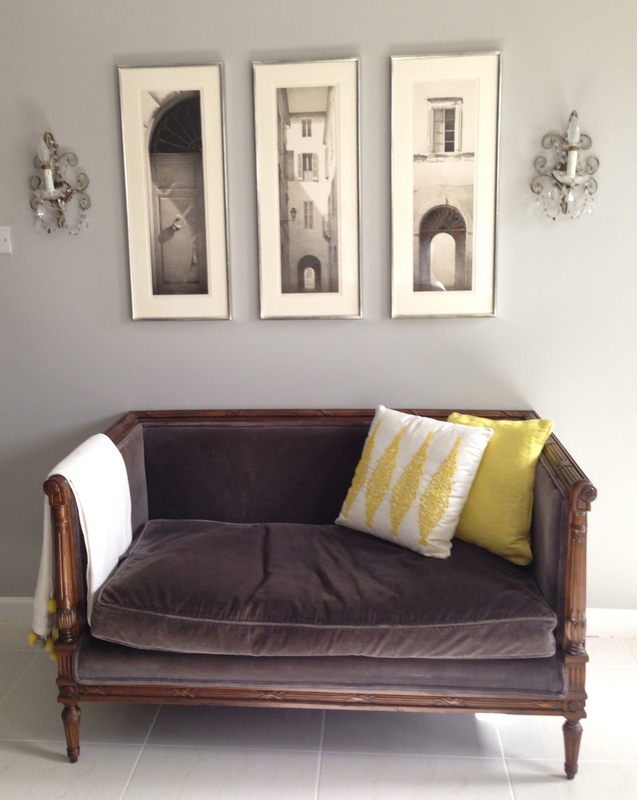 I’m still working on the gallery wall here, grouping antique sketches and etchings. Miles to go before I sleep…well no, not really. Actually, the house is in substantial shape as I ready myself to leave in two days for the next ten weeks of summer, where I’ll be turning my attention to our beloved beach cottage. See you there! While life as an expat in far away lands does bring some decorating joys, i.e. exotic accessories, much of the time basic goods, such as upholstered pieces and quality furniture for reasonable prices, are just not on the agenda. Invariably there are technical difficulties with the technical stuff, voltage variances and possibly language barriers for sourcing parts and hardware, let alone explaining the details of tufted buttons on a headboard. Designing interiors as an expat is much like being on a budget, without the great vintage shopping, thrift stores and Target that are such key resources in America. The best and most reliable places for shopping are often other folks houses – all expats know the best way to get stuff is to hone in on anyone moving back home the moment they announce it. Opportunities need to be grabbed as they tend to be one of a kind and won’t come around again. And the suitcases of all visitors and guests should always be maximized to one’s benefit. 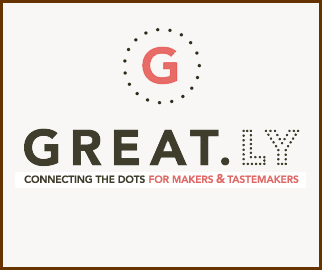 My mantra over the years has always been “get lucky and make do” because it has to be, and while it has definitely brought out my creativity, I occasionally wish I had a few other options on the table. You’ve already heard some of my best stories – certainly nothing will beat the thrill of victory and the agony of defeat that was the free chairs and desk. The colorful scheme of Mally Skok and Raoul Textiles for the kitchen was born out of necessity from the inability to make any changes in our rental. And while I really did want the Saarinen Tulip table for the dining room, it emerged as the absolute front-runner of the three possible schemes simply because it could be had – although perhaps shipping from Malaysia isn’t exactly just had! The IKEA Tobias chairs around it are a classic case of making do with a very happy ending and my living room has a DIY coffee table coming. In the course of this year I’ve had to be resourceful, I’ve had to compromise but the stars have aligned for me at times too. One of my earliest stories here in Doha is a typical tale of triumph against newcomer odds. Long boxed up in storage in Japan, waiting for its imaginary future, this massive pierced brass karakusa (scrolling arabesque) globe chandelier was one of my favorite shrine sale finds ever. Of course in Japan I couldn’t hang it, the ceilings being so low that even basically flush mounted it would have hit the top of my sweet husband’s head (and he is about 6 feet tall). 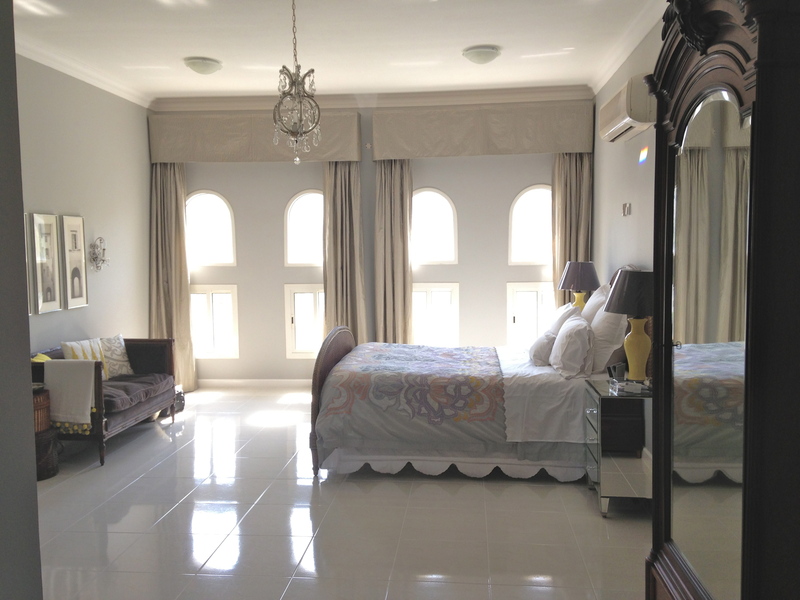 With the high ceilings here in Doha it was time for it to emerge and be hung. Enter said expat challenge, better known as chandelier chain. In America, you can walk into any hardware store and there are rolls of chain in different sizes and finishes. Of course here in Doha there is a single strip of lighting stores, which happens to be tucked behind the largest and most complicated building project in the city, making it almost impossible to get to even after you find it (if you find it!). But in my first weeks here, I managed to get there before closing time (all small businesses close between roughly 12:30 and 4:00pm every day – add that to the planning mix), double parked bravely and illegally (no other way to do it) and ran in. The first shop had only bright brass chain in a single size. As did the second, the third and so on. 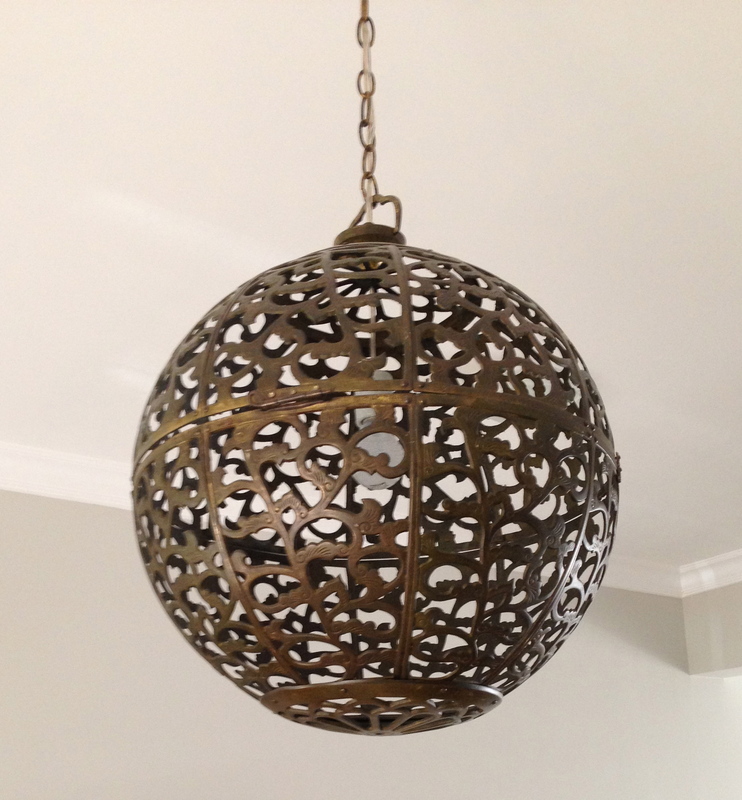 It seems there is only one size and one color finish of shiny brass chandelier chain to be had here in this country and it simply wouldn’t do for my antique fixture. What I did notice was that one small shop had a display chandelier hanging from old chain that was nicely patinated in that dark brass/bronze color even though there was none of it for sale. So I put on my best negotiating skills (all of this at 12:15 while double parked illegally) and managed to convince the owner to let me buy him a length of shiny new chain from another shop to exchange with him (and a little bonus) for his length of old chain. I think he thought I was absolutely nuts, but so be it, mission accomplished! Now it hangs in all its loveliness, casting mysterious shadows at night, and even my 6’7″ friend has no fears of hitting his head on it. Another favorite story has the longest expat legs of all. 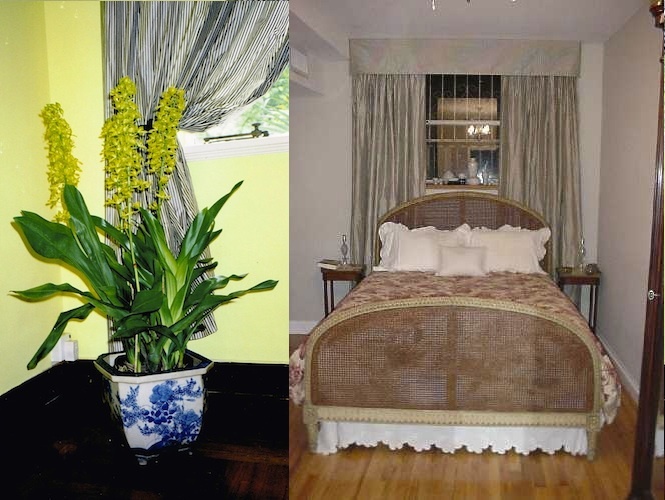 When we lived in Hong Kong from 1997-1998, I had a pair of gray and white silk curtains made – much like a ticking stripe – to hang in my chartreuse dining room. (As an aside, best dining room color ever – with gorgeous old Indonesian rosewood floors, Chinese table, painted Tibetan chest and lots of blue & white porcelain!) Upon moving back to New York City, I repurposed them in my gray bedroom, which had only one window so a single set was very useful. As the window was awkwardly placed near the ceiling, I needed to make a valance, so I asked a friend back in Hong Kong to go buy a bit more of the same silk and send it to me. This was all within the first year of leaving so it was easily done. Dug up some old snapshots (!) 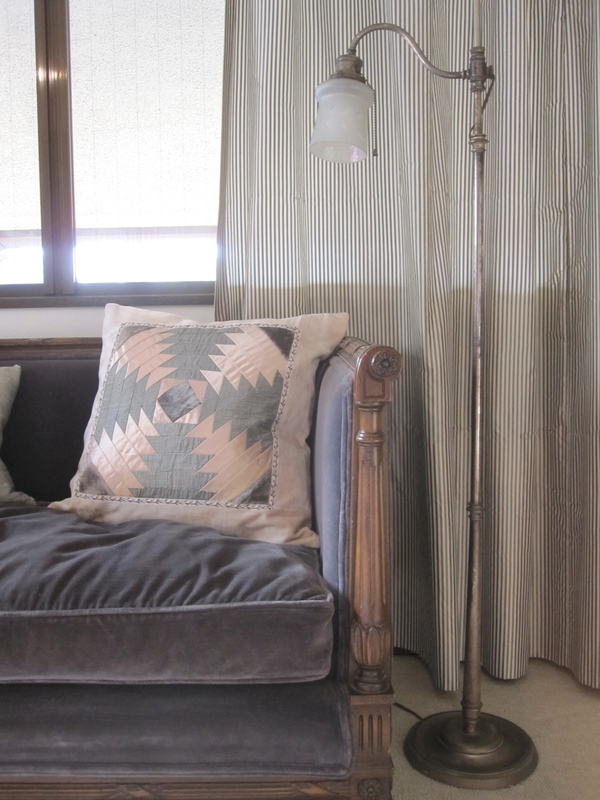 to give a sense of the curtains in both spaces. Fast forward five and half years and off we go to Tokyo where our bedroom had three large windows. Better yet, they were all different sizes – not width wise, but height wise – and the ceiling heights were different in each part of the room. I know it is impossible to imagine or even believe that the Japanese would build this way, but I tell you it’s true – it looked like they sourced the windows willy nilly from a sale. I wanted to use the curtains again because I loved them and nothing beats a classic stripe – it just can’t be improved upon. So I tracked down the shop with the silk (I always keep my samples/orders/receipts from every project in neat little Ziploc bags) and they actually still had some. I bought the rest of their final roll as obviously the decorating gods meant me to and had it delivered to my original curtain lady (she of the obi quilt block pillows). Soon after, I visited some friends in Hong Kong and brought the original pair of curtain panels with me. I had her copy the originals – and here is the kicker – make them all the same original long length. Then I had her hem each set to the random length of the windows in my Tokyo bedroom. One set was hemmed about 2 or 3 feet even. 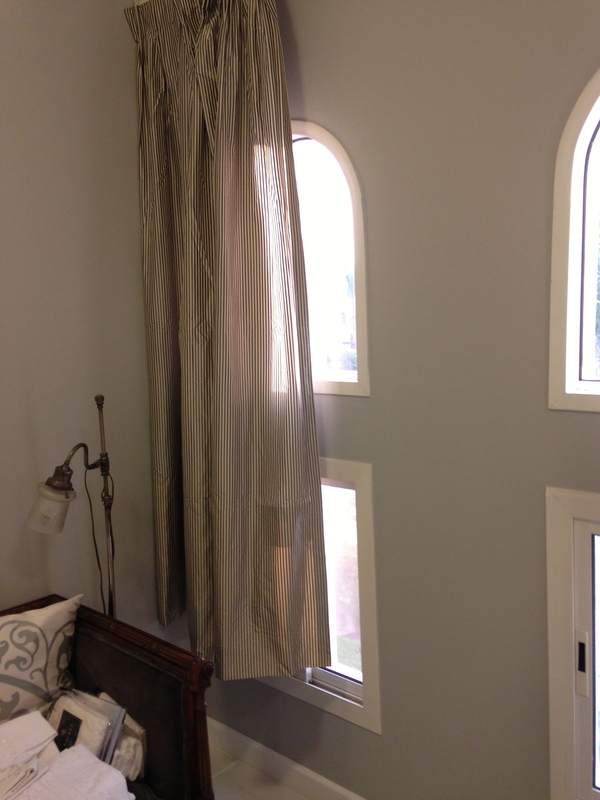 But my instincts told me that there was no purpose to having a bunch of odd size and short curtains in the long run. So now for the moment of triumph. We arrive here in Doha, shake the curtains out from their box and hang them on the existing curtain tracks. They are all way too short, some as much as two feet plus! 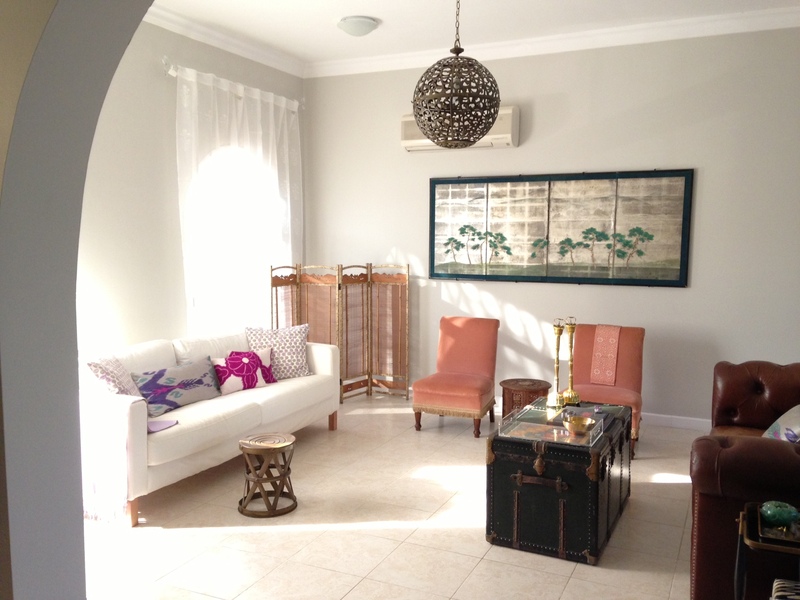 One last story about the kindness of friends and strangers in an expat decorating world. After much deliberation I decided I needed that Pier One/Craig’s List staple the Papasan Chair for my teenage daughter’s room. How can you keep the “no boys sitting on the bed” rule when there isn’t anywhere else to sit? Add in that the room was veering in the slightly too formal direction and that a request for somewhere to “sack out” had been made. Her new desk (our giant antique French partners desk moved from the study) created a perfect deep corner that needed to be filled by something round. I searched the internet for proof that a Papasan could look chic – even Apartment Therapy seemed to be giving them credence – and came up with a few examples, including this one in a similarly colored room. 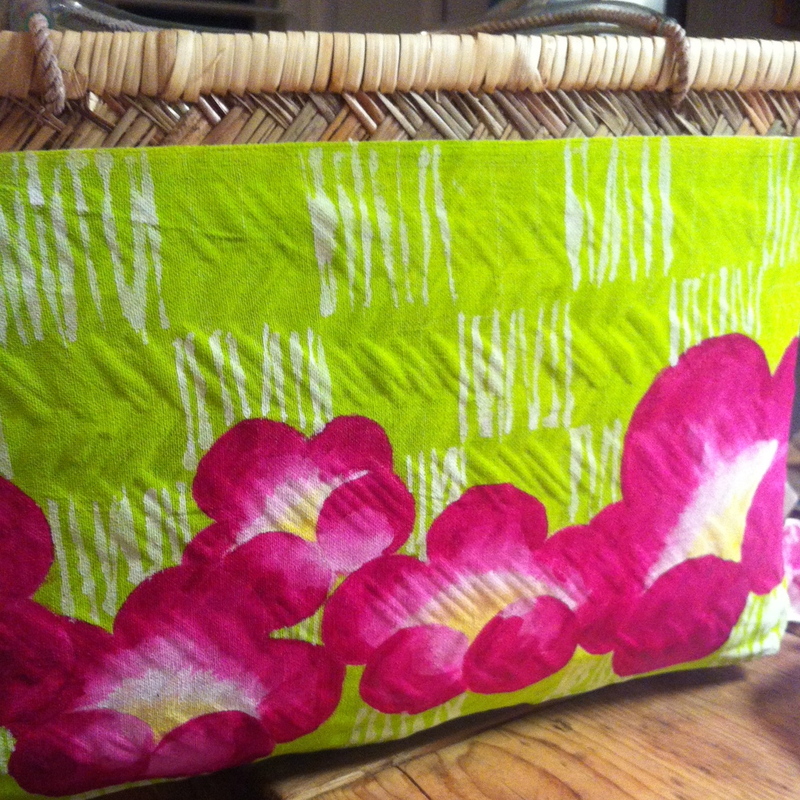 With all things wicker and rattan being back “in” can the Papasan be far behind? Well maybe not, but its just the perfect thing for a teen! All that said, what would be one of the easiest and most budget friendly options to get ahold of in the USA doesn’t exist here in Doha. And the oversized scale of them makes it prohibitively expensive to ship. So I mentioned to a few friends that I was looking for one or something similar. Within a week, my friend LL (come to think of it – she of the lost desk and chairs!) brings me to the house of another woman in her compound, leaving to move back to Canada. 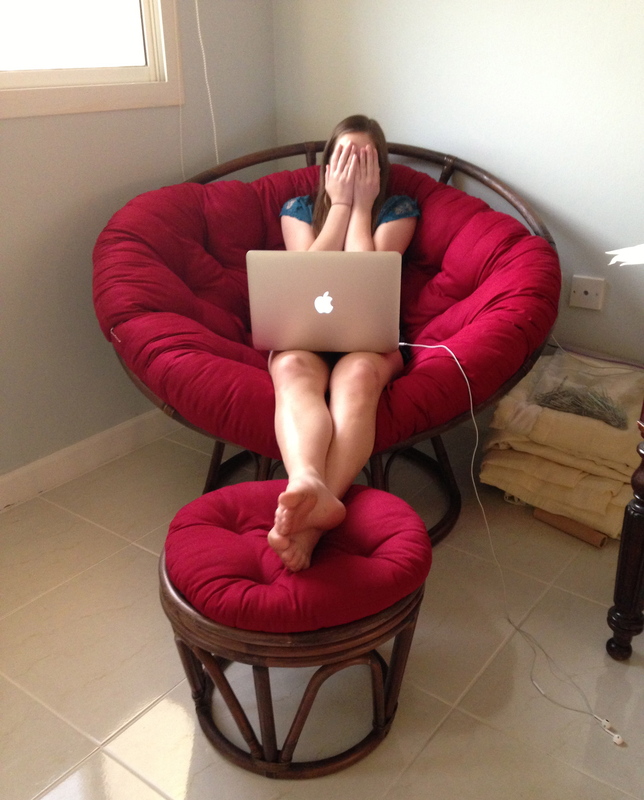 LL had been in her house casing the goods when she noticed a Papasan in the living room, that was not for sale. In classic style, she convinced the woman to sell it to me and just buy a new one when she gets home. Such an expat moment! This is the best I could get my model to give, but you can see it is already being well used. 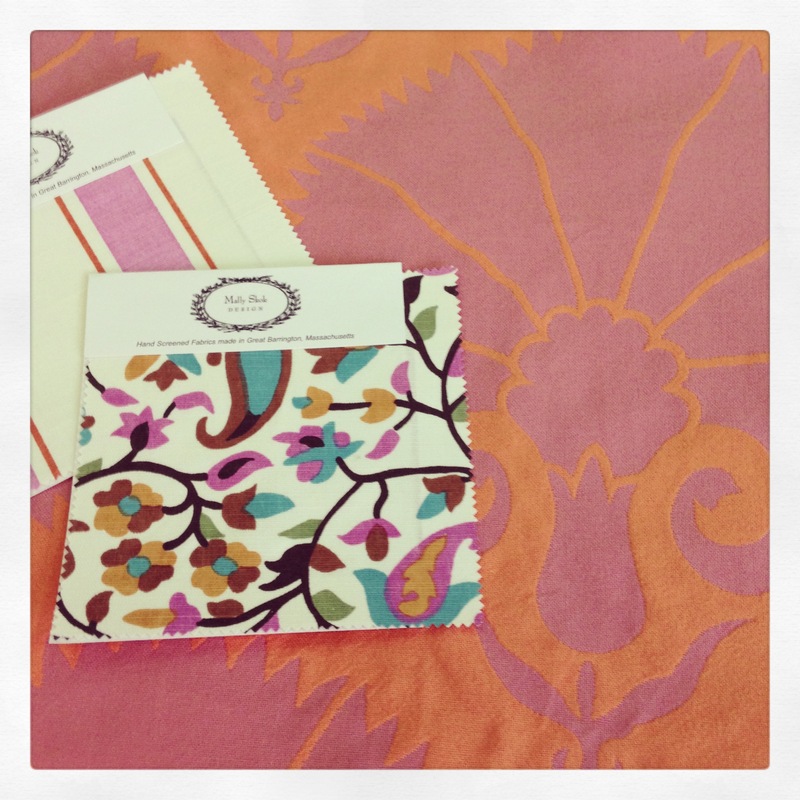 And the cranberry colored cushion has just been sent out to be recovered in white cotton duck. Now much of my experience is only true in the places I have lived, namely Asia and the Middle East. Those lucky enough to live in Europe with its hundreds of years of furniture making its way to market might have a different story to tell. And there will be more on this topic in my next post, as I explore the challenge of updating a bedroom straight out of the Paris flea markets. But in the meantime, what have been your biggest challenges finding and creating your home, wherever you may live? My dear readers, I’ll assume you already know what this post is all about, as you are looking right at it. If you are an email subscriber, please be sure to click into the post and view it on your browser. Welcome to the new Tokyo Jinja, which is the same as it ever was, but all wrapped in a brand new package. It’s been a very long time coming and I know I have talked about it before, but the redesign turned into a slow journey I couldn’t have made on my own. I could not be more excited to be shedding the skin of my old dated blog format! 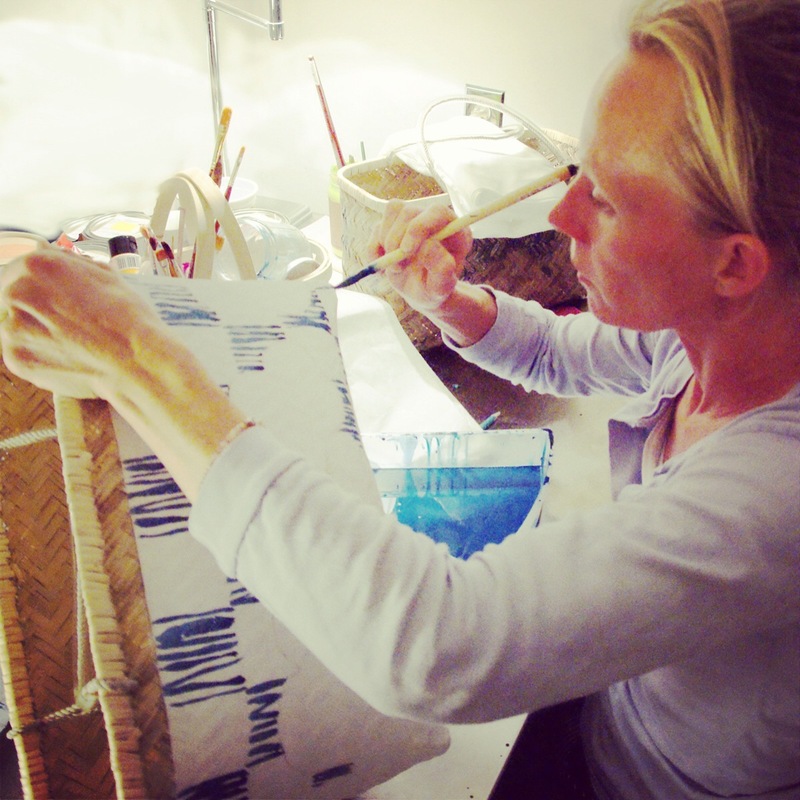 Setting out to convey a bit of where I have been, coupled with where I am now, I am so lucky to have two wonderful artist friends, one steeped in the motifs and designs in Japan, the other new to the desert here in Doha and willing to embrace it. George of papergluebamboo can paint karakusa, the scrolling arabesque vine pattern found on Japanese decorative arts and dear to both our hearts, like no one else. How proper and perfect then that she painted the blue and white karakusa pattern for my new banner. George has been hard at work for an exciting new project we are both involved in – you’ll be hearing about that in my very next post – on some fresh new colorways for her ikkanbari and Japanese shopping baskets. 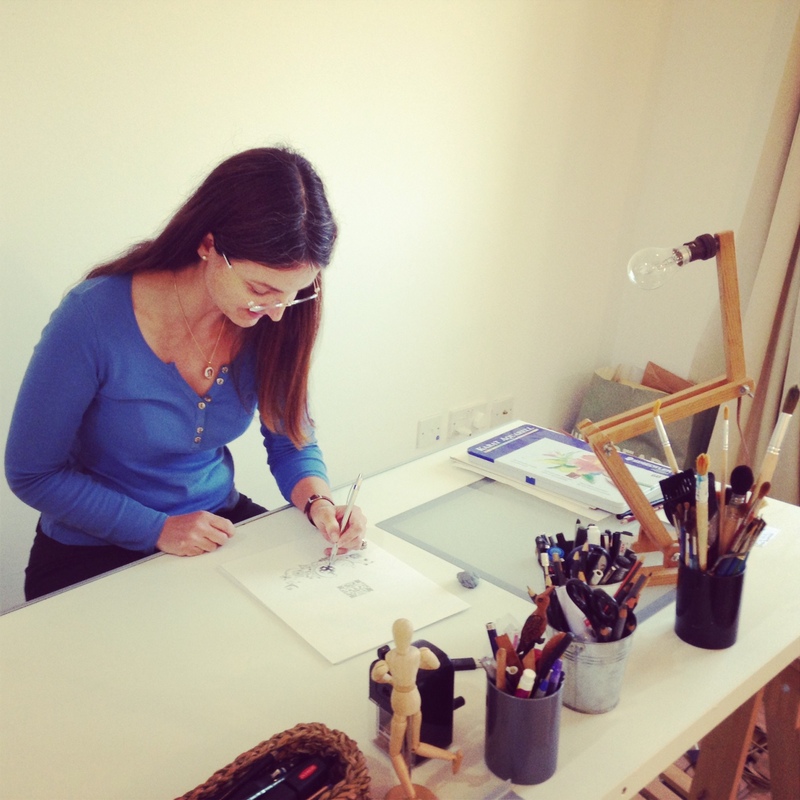 Isabelle Caraës, a French artist and illustrator, is a new friend here in Doha. She creates beautiful finely drawn images and is masterful at their digital manipulation. How proper and perfect that she created the Islamic arabesque pattern found in the mashrabiya, the lattice-work screens, seen all over Qatar and The Middle East. I am just obsessed with them and have mentioned them briefly here and here, but there is sure to be a full post on them soon. You’ve also seen a glimpse of her fantastic house and some of her small works here. 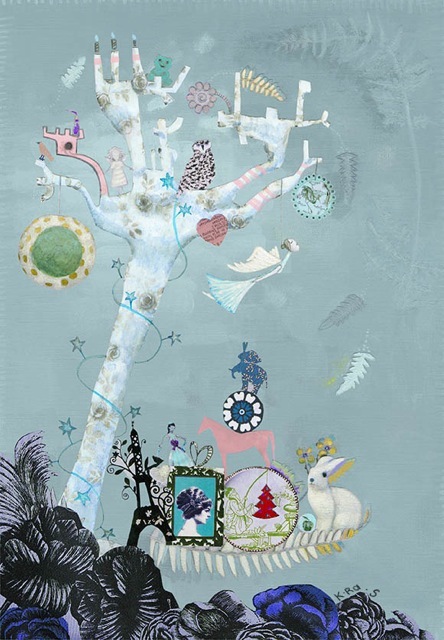 L’arbre, a new mixed media piece, digitally arranged, is a perfect example of her whimsical work. So not to make too much of it, but I love the way the banner is symbolic of my experiences, my friendships and my life over the past ten years. Saraswati Venkatram, better known as Saras, of SV3 Designs has been an outstanding Web Master, professional and impossibly quick to deliver. She transferred my 326 posts (!!!) and thousands of comments over from my old blog format without losing a letter and was invaluable help in the design process. The new format has larger and wider photos, simpler navigation and offers options for the future. Now for some technical notes…I’d say we are about 85-90% finished so don’t be surprised if you notice little tweaks over the next few weeks. Please let me know if you notice any problems, glitches or have any constructive comments. If you are an email follower, hopefully your subscription has transferred over. If you are a follower via WordPress.com, I think you will need to resubscribe, but I am not entirely sure. I am really looking forward to hearing from you all and hope that you like this new and improved Tokyo Jinja reading experience. I’ll also have some other very exciting news coming out on Thursday, so be sure to keep your eyes open for my next post. I was thinking about writing a post to show the variety, similarities and differences of inlay work from around the world when I realized that my own collection was pretty diverse and readily available for photographing. Now that I have rounded it all up here it seems as if I have a lot of inlaid pieces, but because they each seem so different to me I just hadn’t noticed. Every piece has its own story, which is what I love about them all. When we lived in Hong Kong in 1997 and 1998 I was cautious and slow to make purchases. There was a lot of bad “antique” Chinese furniture at the time, although much less so than today. Besides my 18th century bamboo altar table, my blanc de chine and some Japanese porcelain, I didn’t buy much. The only other item to catch my eye was this late Ming Dynasty lacquer, sharkskin and ivory inlaid box. Yes, real Ming Dynasty, as in the one from 1368–1644. It was, of course, way out of my price range and my sweet husband, while very kind and generous, was like “you want to spend what on a box?! ?” So I bided my time and worked a lot and saved and negotiated hard with the dealer, while simultaneously bringing him lots of customers (As one of the best dealers around he did have very good merchandise, so no real ulterior motive there). By the time we were ready to move home, he knew the box had to leave with me. As a side note, it’s not uncommon for very fine antique inlaid boxes, lap desks and the like to be more expensive than much larger pieces of furniture as the finest detail and workmanship went into them as well as the highest quality materials. I’ve never seen a piece to compare with this one. The lacquer is so incredibly soft and silky and the ivory inlay is so fine. I can really see and feel the difference from my bone inlaid pieces. And before some of you get all bent out of shape about the ivory, do remember how old this box is! There are a few small inlay pieces that are green and while I don’t think they are jade as some have suggested, I’m not sure what they are. The edges of the box are wrapped in sharkskin or shagreen, a pebbled leather. There seems to be a four seasons theme, with flowers from each represented as well as the eight auspicious symbols of Buddhism. My favorite view is the side with bamboo, cherry blossom and chrysanthemum. At the absolute other end of the price and quality spectrum, this small round-topped table, with its collapsible octagon base is typically Indian by the style of its foliate carving, although such a common form could be from elsewhere in the region. It is not particularly old nor valuable. I found it at Yaskuni shrine, not long before I left Japan and it seemed like a cosmic signal that the move to Doha was a good next step, being somehow regionally appropriate – a rather broad reading of “local”. It has turned out to be the ideal size and height for between my two antique slipper chairs and thus extremely useful and quite decorative. The bone inlay on this piece is almost irrelevant – literally besides the point – and clearly not secure as much of it has fallen out. It is the screen-like carving on the sides that catches the eye. Pieces like this are sometimes inlaid with brass in lieu of the bone or a combination of the two. Indonesia is not the first place that comes to mind when thinking about inlay, but it does exist as a local handicraft both historically and currently, in particular on the island of Lombok, situated just east of Bali. The term used to refer to the mother of pearl inlaid furniture and accessories produced there is cukli. Without having any documentation, there is no doubt in my mind that the art of inlay arrived in Lombok either via the Dutch, who first visited in 1674, before colonizing the region or hand in hand with the introduction of Islam in either the 16th or 17th century. 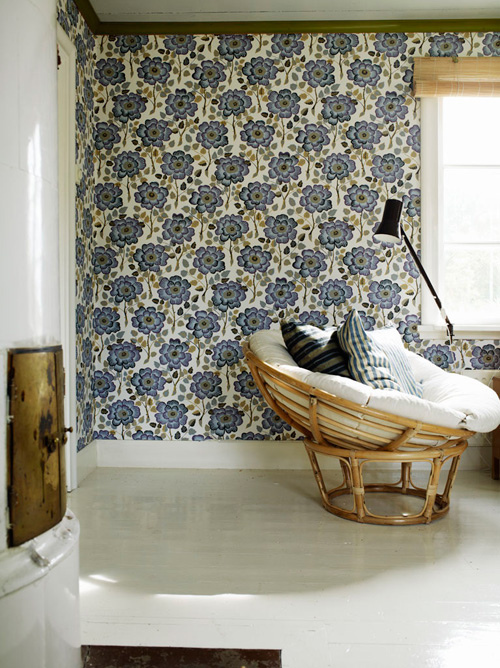 The Lombok pieces are referential to although simplified versions of the North African and Arabic patterns. You’ll see similar pieces in museums made in Burma or the Philippines too, which also had their origins through trade and colonization. My trunk is gently vintage, no more than about 30 years old and in my possession for 15 of those. It is a fairly crude piece, the pattern typical of the work and clearly hand carved and individually glued with small pieces of mother of pearl. It does have a lovely patina which the newer Lombok pieces lack, having often been shellacked to within an inch of their lives. Since I arrived in Doha, two new pieces of inlaid furniture have made their way home with me. Just after moving in, I spotted this inlaid Syrian table at one of the few antique stores in town. It caught my eye immediately as I was hoping that there would still be finds to be made here as I was already missing my shrine sales. I absolutely loved the checkerboard-like detail and the fanciful carvings – it was a much more unusual piece than I’d seen in person before. Since then I’ve seen other even more elaborate museum quality pieces similar to this, but they have had a shiny formality and a stiffness to their design that this piece, with its lovely patina and cheeky pattern, does not. …and this. Pretty perfect, no? My newest addition was unexpected although very needed. As I mentioned in a recent post, the overhead lights here are glaring and I just don’t have enough lamps. I stumbled across this bone inlaid Syrian beauty lying in pieces at a junk shop – it was so inexpensive that it was well worth the risk of buying. One of the charms of Doha is all the very low-priced services – the antithesis of Japan – and for about $12 the electrician rewired it (he came to my house to get it and drop it off) and then for another $12 the furniture repair guys put it back together (they came to my house to get it and drop it off). 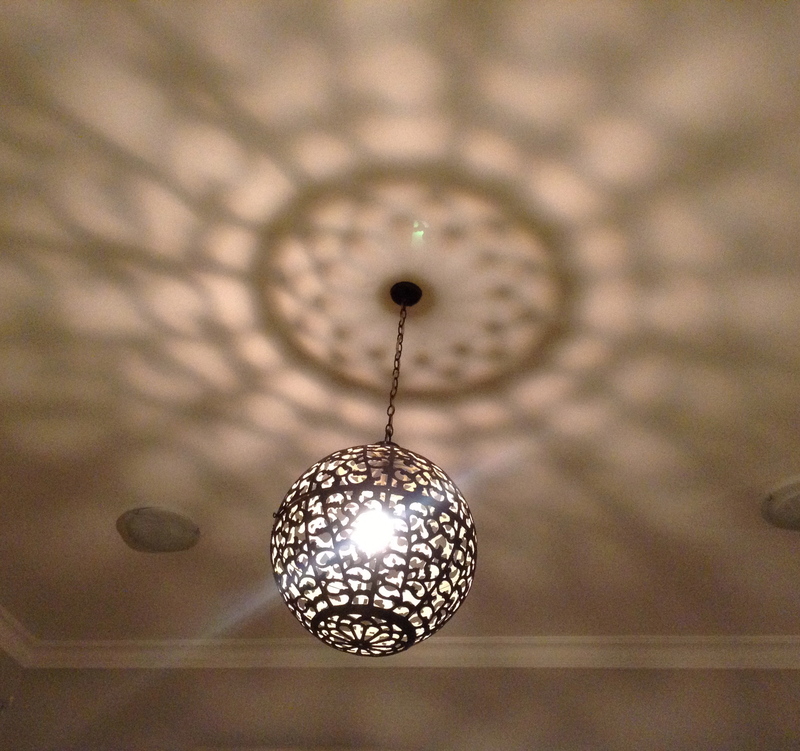 Add an IKEA lamp shade, which still needs a bit of jury rigging, and it is spectacular (if only I could stop by Robert Kime for a lampshade – then we’d be talking off the charts spectacular!) Clearly 20th century – it is electric after all – but nicely vintage based on the brass lamp fittings. The lamp has a typically Syrian detail, the fine wire running through the pattern that in a truly valuable antique piece would actually be silver, brass or another metal. In this case it is also bone. My pieces of inlaid furniture aren’t limited to the house here in Doha. The beach house has its own share, both with the table headed there from above and this set of stacking tables. 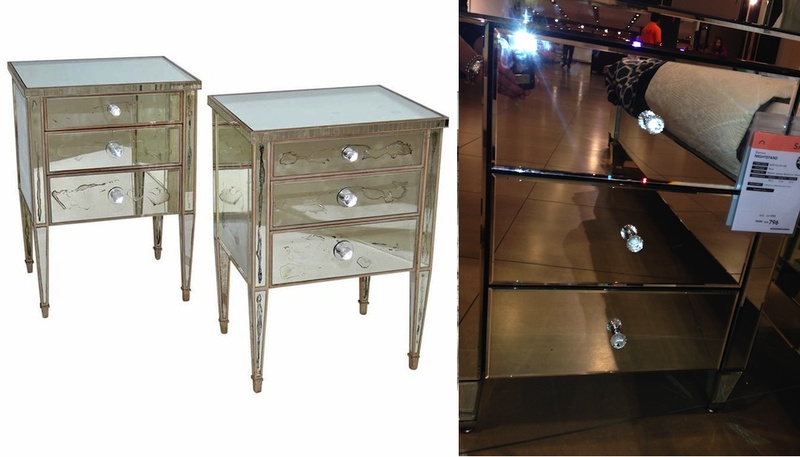 These lovelies are Anglo-Indian – they have a traditional European shape with bone inlay. They were an incredible find in a very run down mixed dealer antiques mall on the Jersey shore in the very first summer after we had just moved in. I spotted them in the corner and knew their petite size and lines would be perfect for the house. After I dug them out, I could feel the radar of every person and other dealer in the place turn and fix on us intently (a comparison I would make to Sauron’s eye in ‘The Lord of the Rings’). I wanted to finish browsing so I turned to my sweet husband and said “do not let go of these for even an instant!” He thought I was being a bit crazy but as the sharks started circling he realized it was no joke. He is nowhere near as experienced as I am in shopping object envy and the way it can make others behave. You can see how fine the detail is in comparison to my newer rougher pieces like the Lombok trunk and the small Indian side table. At the same time, these tables have plenty of nicks and wear, which adds to their charm. They are so flexible and useful, although most of the time they sit just like this, housing the library books in a lovely custom-made market basket by PaperGlueBamboo. And I do actually have another inlaid piece at the shore – a pair of contemporary bone inlay and resin pieces, although I haven’t actually seen them in situ. I ordered the Aleppo side tables from Serena & Lily as my master bedroom night stands at the beach house just as I was leaving at the end of the summer. For some reason they seem to have been renamed the Leila table in the interim and are so popular that they are back-ordered 3-4 months on the website. I’ll have to let you know what I think of it once I get back to the USA for the summer. They are going right in here. Funnily enough, I just realized that don’t have any Japanese antiques or objects that I consider true inlay. My lacquer pieces are surface based and not inlaid. Odd don’t you think? If you have any inlaid pieces you’d like to share, please drop me a note and photo! Energy exists within, between and around everything from the infinitesimal to the astronomical. It seems to have tendencies that manifest itself in similar ways at all scales, a common language. I had both the visual pleasure and an amazing hands-on experience with Colombian born artist Mariana Heilmann’s Resonance exhibit at Katara Art Center this week. Heilmann is a Doha-based contemporary artist who is delving deeply into matters of energy, time and space through a technique of perpetual motion and the innate tendency that chaos has to bring order to itself. Her long-term interest in science feeds and enriches the visual vocabulary of her work as she explores dispersion, connection, repetition and sequence in a variety of mediums. It was a process of sustained repetitive mark making, involving a suspension of thought and a spontaneous release of energy; an attempt to witness and record how continuous, random and chaotic movement tends towards order. The resulting image was like looking through a microscope and a telescope at the same time. A smaller monoprint has one quadrant repeated as mirror image fourths and reads as a kaleidoscope or stained glass or perhaps even neural pathways in the brain. It reminded me of a more visceral version of these from the Damien Hirst exhibit earlier this year. And the church-related analogy turns out not to be very far off. Other works featured map-like collages which are actually enlargements of small fragments of the original drawing fleshed out by cut up x-rays. The light and dark spaces have been reversed in these lucite sandwiched pieces and the cut up x-rays are fragmented and ghostlike. My immediate visual connection to these pieces was seemingly unrelated to Heilmann’s references as I saw the traditional architectural jali screens so common to this region. But my comment sparked a larger conversation about the nature of Islamic ornament – so often geometric – and its relation to god. From there we touch on the perfection of the universe, which brings us right back round to the works being a meditation on the universe and the interconnectivity of everything. Functionally, Heilmann has dreams of these pieces being used in just the manner I suggest, as large-scale panels or dividers, perhaps quite apropos in the entryway of a hospital. I love that you can see our engaged conversation as a reflection in the photo. Also included were some elaborate two-dimensional works made from string. The photos cannot begin to do these pieces justice, making them look just like drawings, but take my word for it, they are spectacular. The thread pieces have come from a very different tempo than the fast and chaotic energy of the drawings. Nevertheless, they are still an exploration of repetitive movement and the resulting web that emerges from this. Earlier work, from an exhibit at Virginia Commonwealth University last year, was a meditation on similar themes, in this case using end of life materials like milk cartons assembled into mysterious landscapes. This last-gasp final dispersion of energy from these disposable objects is about as good of an end game as a milk bottle could ever hope for. The link between this piece below and the one above, while reversed in color, is a similar examination of the microscopic versus the cosmic. All of her work has a luminescent beauty, but nowhere more so than in these translucent collages. Again, are we viewing moonscapes or cellular bodies? On Saturday night I participated in her Action Drawing Workshop, which “allows the participants to embark on their own exploration of how energy manifests itself.” We rocked out to techno music while allowing our conscious minds to let go – basically a rave for the artsy set. The piece I made to the song in the video was my best attempt and I am thinking of grabbing an IKEA Ribba frame and hanging it – not for the long-term, mind you, but as a placeholder until I find something I really want. As I am finishing up writing, my mind leaps ahead to my upcoming trip back to Japan (yes!!!!) and it occurs to me that the x-ray collages are also reminiscent of resist dye techniques like tsutsugaki and batik. The indigo variations in this piece look hand-dyed by a master! If you are in Doha, the show runs through March 8 at the Katara Art Center. Don’t miss it. And if you see Mariana around, be sure to introduce yourself – she is absolutely lovely! If you are interested in contacting her, feel free to drop me an email at jacquelinewein[at]yahoo.com. All images copyrighted by Mariana Heilmann. Please do not re-post without writing to me for permission. Thank you.